Jerome Lemelson’s inventive legacy touches nearly every facet of our everyday lives. One of America’s most prolific inventors, he earned more than 600 patents for inventions relating to automated manufacturing systems, bar code readers, automatic teller machines, cordless phones, cassette players, camcorders, fax machines, personal computers, machine vision, and medical technology. What may be surprising, though, is that about 10 percent of those patents describe toys—inflatable toys, jumping toys, toys with propellers, toys that run on tracks, target games, dolls, and more. In fact, Lemelson’s first patent, issued in 1953, was for a new kind of propeller beanie. 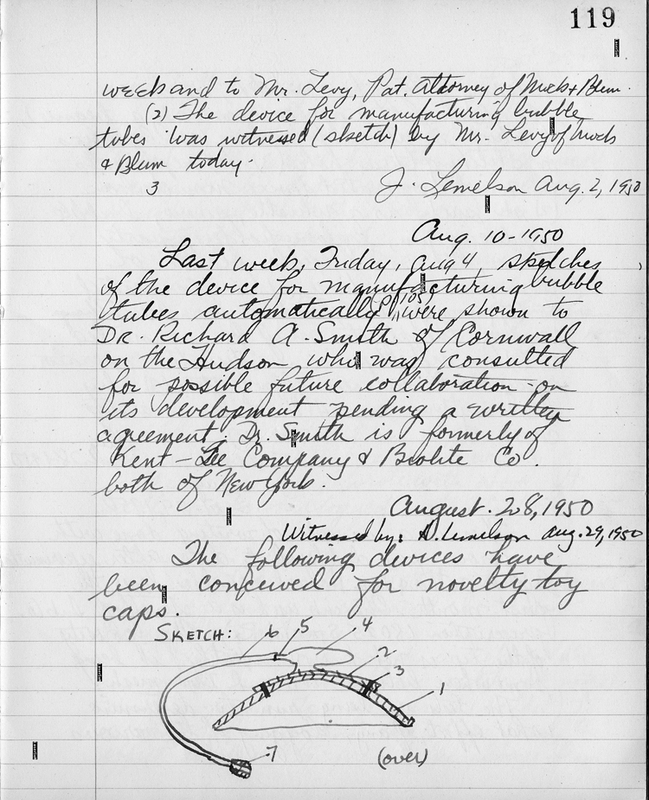 This page from one of Jerome Lemelson's invention notebooks shows his sketch for his first issued patent—a new kind of propeller beanie that didn't need wind. The wearer could blow into a tube to spin the propeller, or swap the propeller for a whistle. Courtesy of the Lemelson Family. One of the most interesting things about Jerry Lemelson’s toy patents is the way in which they parallel interests that he was pursuing in other fields. For example, a number of his inventions incorporate the behavior of fluids (gases and liquids), magnetism, light, and sound. So his version of the propeller beanie (U.S. Patent 2,654,973) didn’t rely on the vagaries of wind, but instead used an attached tube through which the wearer could blow to spin the propeller or sound a whistle. Counterparts on the more serious side included inventions in aircraft structures and materials, and a balloon-actuated catheter. Similarly, his ideas about sound manifested themselves in a barking, jumping toy dog, a toy gun that makes a ricochet noise, and a crying doll, as well as magnetic sound-recording devices and ultrasonic cleaning devices. The properties of magnetism were at the heart of a toy mine detector, various ways to move toy cars along a track, and a magnetic fishing game, and also of audio and video magnetic recording and reproduction apparatus. Inflatable toys with “eyecatching optical effects,” reflective highway construction markers, lenticular displays, reflective thread to be woven into cloth, and light-sensitive material for contact lenses reflect Lemelson’s examination of the properties of light. Magnetic inventions: One of several Lemelson patents that relate to magnetic recording. 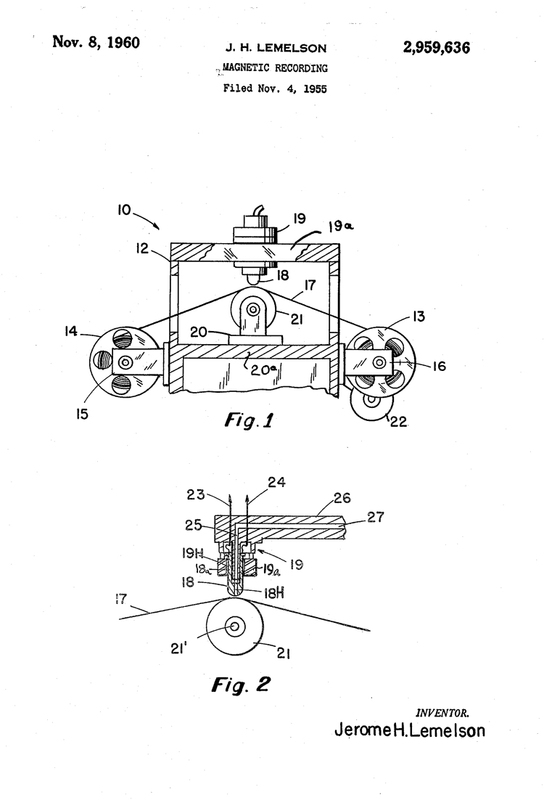 Lemelson’s patents also illustrate an exploration of the use of new materials, especially plastics, for both toys and other objects. There are inventions pertaining to manipulating plastic, including injection molding and extrusion processes. And there are toys and other inventions made of plastic: inflatable toys and envelopes made of sheet plastic; plastic illuminated highway markers; flexible plastic tracks for toy cars; plastic product containers; and plastic kites, gliders, and model airplanes. 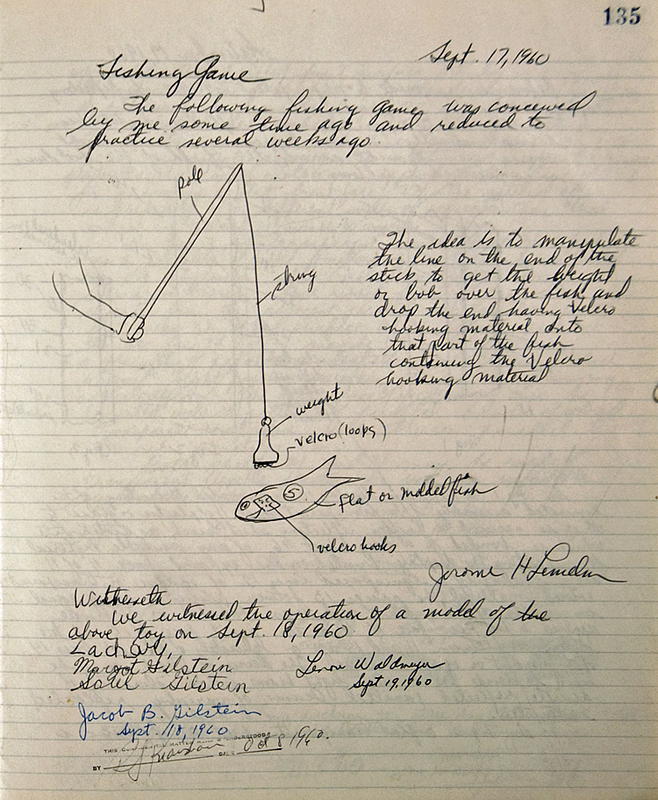 New materials: Lemelson's sketch for a fishing game using Velcro (George de Mestral, the inventor of Velcro, had only received his patent 2,717,437 in 1955). Courtesy of the Lemelson Family. To see examples of Lemelson’s toy inventions that show some of the stages in inventing a new plaything, visit the Inventive Minds gallery in the Lemelson Hall of Invention and Innovation on the first floor of the Museum.